Lightning Breath (Recharge 5–6). The dragon exhales lightning in a 90-­foot line that is 5 feet wide. Each creature in that line must make a DC 19 Dexterity saving throw, taking 66 (12d10) lightning damage on a failed save, or half as much damage on a successful one. 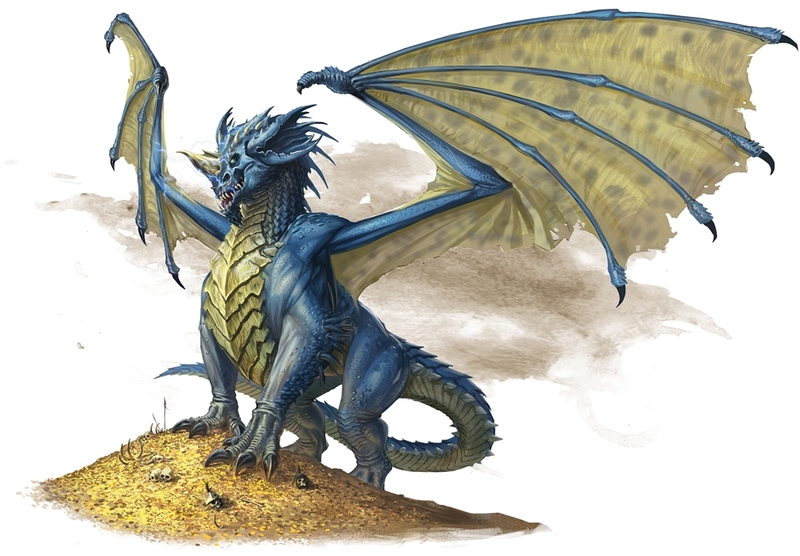 Blue dragons make their lairs in barren places, using their lightning breath and their burrowing ability to carve out crystallized caverns and tunnels beneath the sands. Thunderstorms rage around a legendary blue dragon’s lair, and narrow tubes lined with glassy sand ventilate the lair, all the while avoiding the deadly sinkholes that are the dragon’s first line of defense. A blue dragon will collapse the caverns that make up its lair if that lair is invaded. The dragon then burrows out, leaving its attackers to be crushed and suffocated. When it returns later, it collects its possessions — along with the wealth of the dead intruders. Part of the ceiling collapses above one creature that the dragon can see within 120 feet of it. The creature must succeed on a DC 15 Dexterity saving throw or take 10 (3d6) bludgeoning damage and be knocked prone and buried. The buried target is restrained and unable to breathe or stand up. A creature can take an action to make a DC 10 Strength check, ending the buried state on a success. A cloud of sand swirls about in a 20-foot-radius sphere centered on a point the dragon can see within 120 feet of it. The cloud spreads around corners. Each creature in the cloud must succeed on a DC 15 Constitution saving throw or be blinded for 1 minute. A creature can repeat the saving throw at the end of each of its turns, ending the effect on itself on a success. Lightning arcs, forming a 5-foot-wide line between two of the lair’s solid surfaces that the dragon can see. They must be within 120 feet of the dragon and 120 feet of each other. Each creature in that line must succeed on a DC 15 Dexterity saving throw or take 10 (3d6) lightning damage. Thunderstorms rage within 6 miles of the lair. Dust devils scour the land within 6 miles of the lair. A dust devil has the statistics of an air elemental, but it can’t fly, has a speed of 50 feet, and has an Intelligence and Charisma of 1 (−5). Hidden sinkholes form in and around the dragon’s lair. A sinkhole can be spotted from a safe distance with a successful DC 20 Wisdom (Perception) check. Otherwise, the first creature to step on the thin crust covering the sinkhole must succeed on a DC 15 Dexterity saving throw or fall 1d6 × 10 feet into the sinkhole. If the dragon dies, the dust devils disappear immediately, and the thunderstorms abate within 1d10 days. Any sinkholes remain where they are. I am so going to use this in my adventure, which is going to take place in the Kingdom of Litore, a costal kingdom with many beaches and port towns and cities.